When meeting with some members of parliament I have used a gun control analogy to explain digital locks applied to communications technology. A minor form of gun control is being hotly debated in parliament and the media in the context of a private members Bill C-391, which has "repeal of long-gun registry" in its title. A highly controversial form of third-party control over communications technology is part of copyright Bill C-32, even though this key aspect of the bill is not yet adequately understood. I felt it might be an interesting thought experiment to compare and contrast these two proposals and the political debate surrounding them. In my case this thinking was useful for me to better understand the opponents of the Canadian firearms registry, and thus it may be helpful in allowing others to better understand opponents to legal protection for technological measures. Jailbreaking must be legal, but should you do it? You will be hard pressed to find someone who find the practise of applying technology locks to someone elses property more reprehensible than I do. This is what I feel of the practise of companies like Apple and Sony who sell technology where they, not the owner, retain the keys to the technology and treat their owners as attackers of their own property. I believe that this practise should be clearly outlawed, while backward facing legislation such as the Conservative Bill C-32 seeks to legally protect it. While this is true, I recommend against what has become the most common form of jailbreaking. One of the features of this site is an interface to send a letter to your MP. We are in the process of drafting a new letter which focuses on Bill C-32 and TPMs. There is an existing general copyright letter which I've updated that may be more what you would like to send. The main purpose is to ensure MPs are aware of your interest in copyright, and possibly to be willing to speak with us before or during committee hearings on C-32. MPs return to parliament on September 20'th, and the earlier we start conversations the better. Summary: The types of activities which copyright regulates all assume that you already have access to content. Copyright never concerned itself with concept of access, which was left to other laws. Technical measures can restrict access, but can't in the real world directly restrict the types of activities that copyright regulates. Copyright and technical measures are disjoint, but technical measures and other areas of law such as contract and e-commerce overlap. Is technology useful for stopping an authorized person from doing things which Copyright regulates? Should we radically change "Copyright" to address this problem, or is this a non-Copyright issue? Form letter from Heritage Minister James Moore. On August 5'th I received an email that was "From: min.moore@pch.gc.ca". It had no content, but two file attachments - one HTML and one GIF. Thunderbird warned that it was most likely a scam, given this is a common technique used by spammers to avoid SPAM detection software. I extracted the file attachments, and I wasn't all that surprised to learn that it was a form letter originating from the Heritage Minister's office. This isn't the most technologically literate Minister or department in Canada, and it was unlikely that ensuring emails wouldn't be confused as SPAM or scams would be something they would know much about. The GIF image was a scan of a form letter, which reads as follows. Having read it, I think Thunderbird was right to have automatically detected it as a scam. 2010-06-11: I sent a letter this afternoon to my Member of Provincial parliament for Ottawa South, who happens to be Premier Dalton McGuinty. I copied it to my federal MP, as well as to Andrea Horwath, Leader of Ontario’s New Democrats, and Tim Hudak, Leader of the Ontario PC Party. Update 2010-07-29: I have sent an additional letter to Mr. McGuinty. Thank you for your letter of July 27, 2010, in response to the letter I sent on June 11, 20101. I hope that you will reconsider the response, which was to say that it would be inappropriate for you to comment on a federal piece of legislation. I forgot to include a link to the FAQ on why I disagree with what CMEC has been asking for. 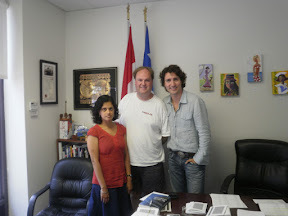 I met with Justin Trudeau at his office at 625 Faillon Street in Montréal, Québec, from approximately 15:00 to 16:00 on Monday July 19'th. My wife attended as she was interested to meet Mr. Trudeau. The conversation was primarily about Copyright, and when it was nearing 16:00 it was Rina and not one of Mr. Trudeau's staffers that had to remind us that the office was closing when it seemed we might head off into other topics (Census, patenting of life, ....).